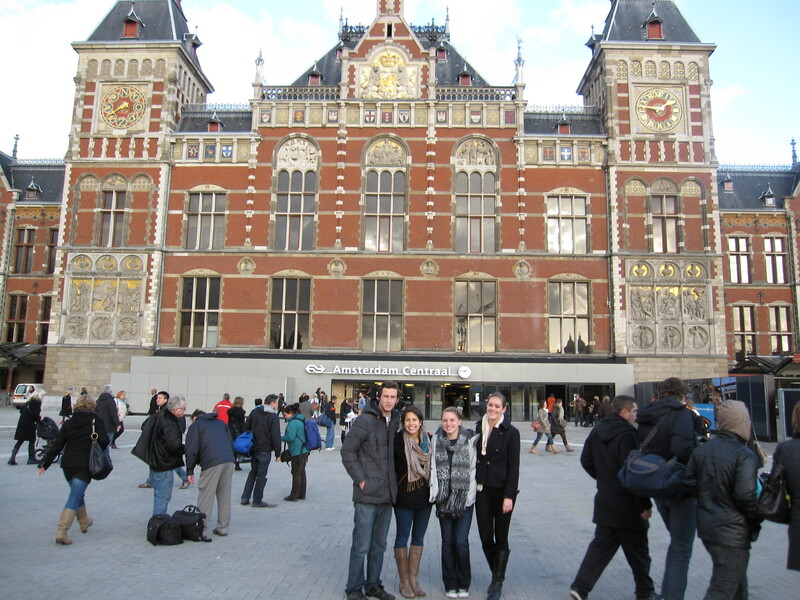 I’m finally having a break in my studying to write about the trip Julissa, Kelly, and I took to Amsterdam last week. I can hardly believe that the next time I’m going to be on a plane, that plane is going to headed home! I remeber when the girls and I first started planning and booking these trips, I never would have imagined that time was going to fly by as wuickly as it has. 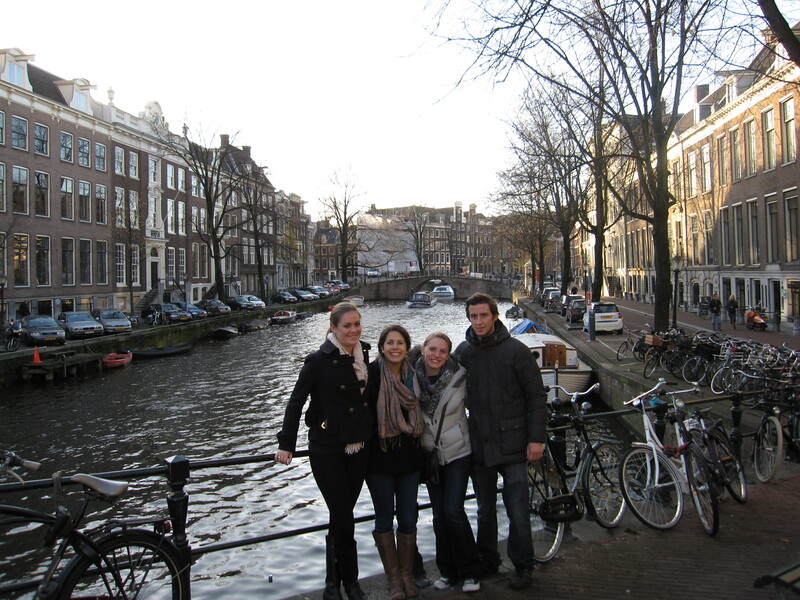 But, our final trip was to the amazing, beautiful, and relaxing canal city of Amsterdam! 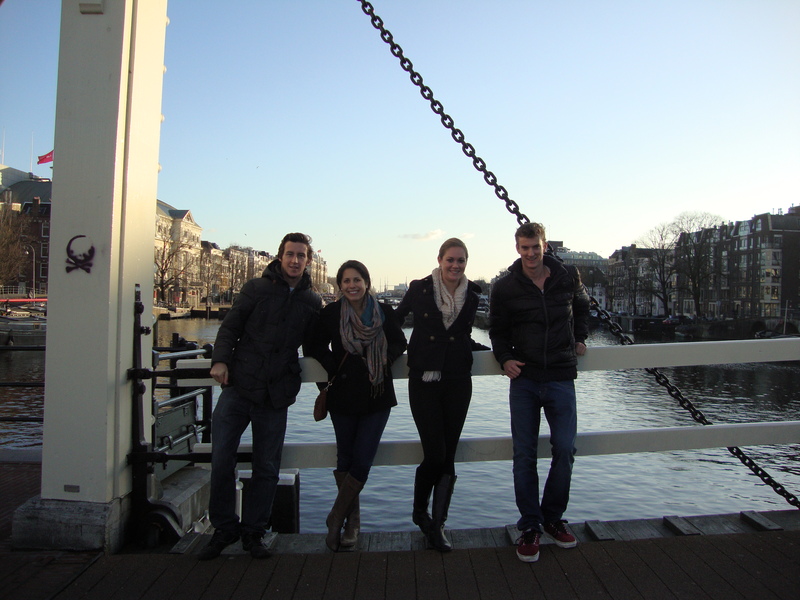 We again took an early morning flight on Friday out of Luton airport, and arrived in Amsterdam at around 9 am. We then made our way to Roderick and Roelof’s apartment. Roderick and Roelof are to native Holland-ers that Julissa met on vacation a couple of years back taht she has continued to stay in contact with. They offered us free accomodation at their apartment for the weekend. We got to their place at aroud 10 am. All of us then set off on a walking tour of the city! We walked past the major square where the Rijks and Van Gough Museums were located, we walked down the main shopping street, through Rembrandt and Dam Square, and walked through Centraal Station. I did not expect Amsterdam to be as beautiful as it was. I also had no idea that there were so many canals? It was beautidful and reminded me of Venice, except it was a lot less crowded. 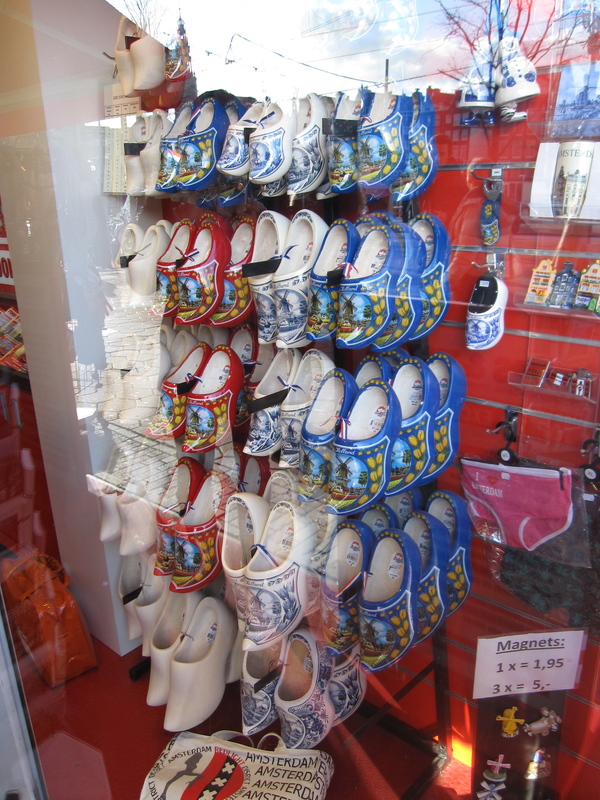 The city of Amsterdam does not have that many tourist sites and attractions as the other cities that we’ve been to. I think that the majority of tourist come to Amsterdam to enjoy the culture and take in the scenery. There were so many people walking around and biking, every where we went seemed so relaxing and easy going. The city has over 2,000 bridges and there are actually more bikes in Holland than there are people?! Just put that into perspective. The next day was Saturday and the girls and I woke up and walked over and took a tour of the Rijksmuseum, where they feature pieces by artist like Vermeer and Rembrant. The museum itself was under construction, but thankfully they still had all the popular pieces on display. After we made our way through the different exhibitions, we walked through the winding streets of Amsterdam that line the canals to the Anne Frank House, where we were able to take a tour of the actually living space that Anne and her family lived in when they were in hidingat the beginning of World War II. This was perhaps the best museum I have been to in Europe because they provided the right amount of imformation that wasn’t overwhelming and had short little video interviews and picture slides going in each of the rooms. It was very well done. The girls and I then took a break and sat down and got some lunch outside of Centraal Station before we hopped on a boat for a canal tour. It was a really cool and different way to experience the city, however, I wish that there would have been a live guide giving the tour instead of a monotone recording that started to put me to sleep at the end. Whoops. We still managed to find out some interesting facts and got to take some cool pictures! On one of 2,000 bridges! 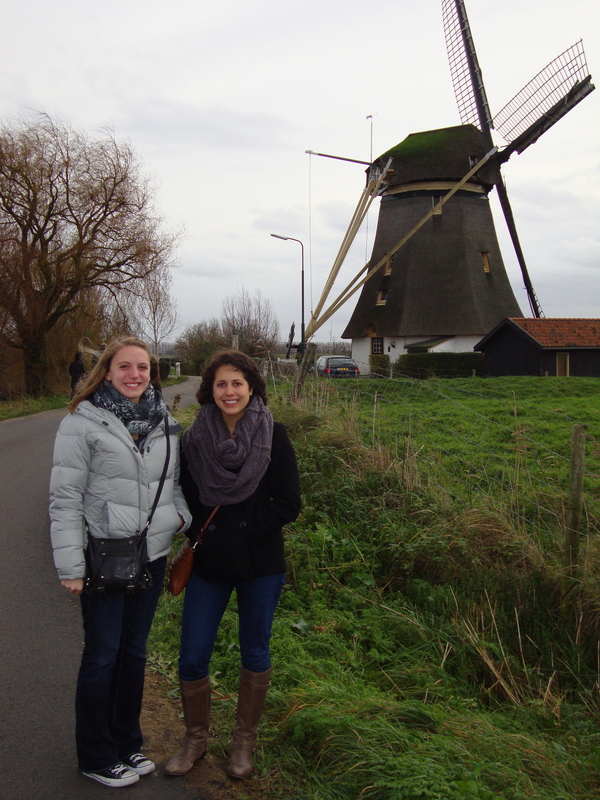 On Sunday morning after we had all slept in, Roderick and Roelof took us to their hometown which is 15 minutes by car outside of Amsterdam where they showed us Holland’s oldest windmill! It was smaller than I had imagined, and I was shocked to find out that people actually live in the windmill today?! We ended up just spending the afternoon at Roelof’s house watching the Davis Cup and some footy matches on the TV. It was actually really nice to relax under a blanket in someone’s living room and just veg on the couch watching TV. I haven’t done that since I was back home in the States three months ago! We left Roelof’s house around 5 pm, and went and grabbed dinner at an Italian restaurant back in Amsterdam before Roelof and Roderick drove us to the airport. Amsterdam was one of the most relaxing trips I’ve taken, and it was definitely the right choice of city to go to right before final exams and papers are due. Now that we don’t have any more trips to look forward to, I guess I better buckle down and study. It had to happen sometime, right? My last final and paper are due on Wednesday, and my plane to come home isn’t until Monday. It will be really nice being done with work and being able to enjoy my final days in London. I am a junior at Lafayette College in Easton, Pennsylvania, double-majoring in Psychology and English and am a middle distance runner on the track and field team.